Melodic, swinging, original, "makes you want to get out of your chair and dance" jazz by an all star quintet featuring clarinetist Russ Reinberg and trombonist Dan Barrett. Duke Ellington once said, “There are two kinds of music: Good and bad.” Westlake Records’ album, A Fool’s Errand, brims with the former, over an hour of consistently good music. Westlake selected the finest Swing jazz musicians in California to perform seventeen original tunes by clarinetist Russ Reinberg, then digitally recorded them with some of the world’s finest ribbon microphones and audio components. The album’s superb sonics combine the clarity of digital with the warmth and richness of analog. More about music: We live in a very odd world. It is a place where people judge art, music, and almost everything else by whether it is “in style”. Fashion, along with war, are two of man’s most asinine ideas. If something is good, especially music, it never goes out of fashion. Despite the opinions of some twelve year olds, Mozart, Bach, Brahms, and Beethoven have never gone out of fashion. And despite snobbish nonsense by some contemporary jazz aficionados or the inability of immature listeners to appreciate them, Benny Goodman, Artie Shaw, Duke Ellington, and Count Basie (among others) endure as icons of the Golden Age of American culture. Listen to the album. 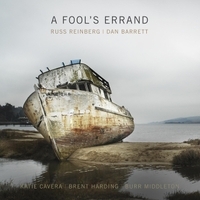 The uplifting, hard swinging rhythm section of Katie Cavera’s guitar, Brent Harding’s upright gut string bass, and Burr Middleton’s drums may yank you out of your chair and inspire you to jump around. While Dan Barrett and Russ Reinberg swing just as hard themselves, both are masters of traditional blues and melodic ballads. Their interpretations and improvisations may touch your heart. It’s that kind of album with that kind of music. It gets to you. Before long you may find yourself in an unusually good mood. By the way, Raj Naik created the cover art.